In this seductive, wistful masterpiece, Truman Capote created a woman whose name has entered the American idiom and whose style is a part of the literary landscape. Holly Golightly knows that nothing bad can ever happen to you at Tiffany's; her poignancy, wit, and naïveté continue to charm.This volume also includes three of Capote's best-known stories, “House of Flowers,” “A Diamond Guitar,” and “A Christmas Memory,” which the Saturday Review called “one of the most moving stories in our language.” It is a tale of two innocents—a small boy and the old woman who is his best friend—whose sweetness contains a hard, sharp kernel of truth. Truman Capote was born in New Orleans in 1925 and was raised in various parts of the south, his family spending winters in New Orleans and summers in Alabama and New Georgia. By the age of fourteen he had already started writing short stories, some of which were published. He left school when he was fifteen and subsequently worked for the New Yorker which provided his first - and last - regular job. Following his spell with the New Yorker, Capote spent two years on a Louisiana farm where he wrote Other Voices, Other Rooms (1948) . He lived, at one time or another, in Greece, Italy, Africa and the West Indies, and travelled in Russia and the Orient. He is the author of many highly praised books, including A Tree of Night and Other Stories (1949) , The Grass Harp (1951) , Breakfast at Tiffany's (1958) , In Cold Blood (1965) , which immediately became the centre of a storm of controversy on its publication, Music for Chameleons (1980) and Answered Prayers (1986) , all of which are published by Penguin. 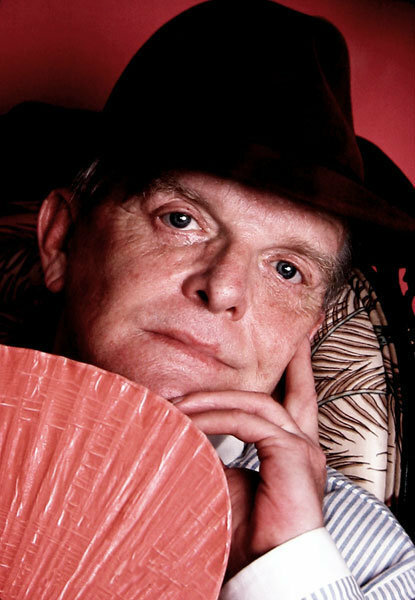 Truman Capote died in August 1984. Photo by Jack Mitchell [CC BY-SA 4.0-3.0-2.5-2.0-1.0 (http://creativecommons.org/licenses/by-sa/4.0-3.0-2.5-2.0-1.0) ], via Wikimedia Commons.